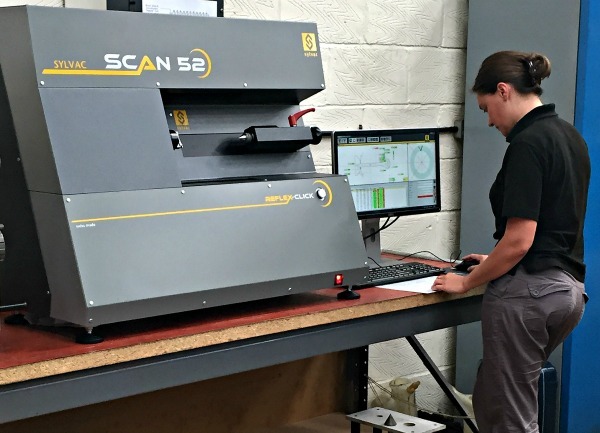 Rugby based precision engineering company Technoset has invested in a Sylvac Scan 52 machine from Bowers Group for the measurement of components on the shop floor. The Sylvac Scan 52 enables Technoset to automate measurement processes and save data electronically, saving huge amounts of time whilst delivery fast, accurate results. Technoset is part of the Techno Group, which comprises of Technoturn and Technoset. Established in 1978, Technoset specialises in the precision machining of components from high performance materials using multi axis turning and milling machining centres. Technoset holds ISO9001 and AS9100 certifications, and is part of the Coventry and Warwickshire Aerospace Forum and the Midlands Aerospace Alliance. The company primarily serves the aerospace market, with 65% of business coming from aerospace and the remainder made up of automotive, laser, fibre optics and other high end technologies. Typical aerospace components manufactured at Technoset include engine parts, actuators, fuel systems and fire detection system components. The company is currently investing in the very latest equipment and technology to continue in the accurate manufacture of sophisticated, high precision parts. Technoset machines a variety of materials and a wide range of different parts, many of which have complex geometries and tight tolerances. The various features and characteristics of some parts are very difficult to measure traditionally, making manual measurement of parts not only labour intensive, but also time consuming. FAIR (First Article Inspection Reports) are routinely issued to customers, which contain a full dimensional report. These can be very time consuming to compile when every feature has to be measured and recorded manually. For example, an individual component that has been machined on the lathe may have over 75 features requiring measurement. Realistically, this could take an operator more than half a day to measure when inspected manually. Technoset was keen to reduce the company’s reliance on manual measurement and the traditional method of measuring parts, especially on the shop floor. Using traditional methods of measurement at the point of manufacture whilst using the latest non-contact CMM’s and optical kit at final inspection can cause all sorts of problems. As an aerospace approved business, high levels of traceability are critical. Every time a manual measurement was made, members of staff were required to record the results on a process check sheet, which was not only very time consuming, but also carried the risk of potential errors made when writing down results. Traditionally, only conforming measurements are recorded when the process is carried out manually. This creates a problem when carrying out root-cause analysis enquiries because the process check sheets do not contain any out of tolerance readings. Operators would make the necessary adjustments and therefore only record the in tolerance measured results. In recent years, Technoset has consciously moved to lower volume, highly sophisticated products which naturally require more economical and accurate methods of measurement. As part of its development, Technoset has invested heavily in the very latest machine tools for its shop floor and inspection kit for the inspection department. The missing piece of the puzzle for the company was the latest inspection kit fit for the shop floor environment. Technoset were, therefore, looking for an accurate and convenient method of measurement that would be fit for the production department. After doing some essential research, Technoset Managing Director Kevan Kane spoke to various existing Sylvac Scan 52 users and was impressed with the feedback he received. Kevan subsequently approached Bowers Group, who provided Technoset with the Sylvac Scan 52, a fast and precise horizontal optical measurement device specially designed for the workshop measurement of cylindrical parts close to the machine tool. Suitable for first-off part, in-process inspection including Statistical Process Control, sampling, and 100% inspection, the Scan 52 allows Technoset to measure components in the same location as they are machined i.e. on the shop floor. 60 - 70% of the components manufactured at Technoset can be measured using the Scan 52 in some format, and in most cases, approximately 70% of features and characteristics of those components can be measured using the machine. The Scan 52 takes minutes to program, after which full dimensional reports can be generated at the push of a button and automatically saved to the server. This means that paper documentation is no longer needed, and manual input of data is not required. The machine collects conforming and non-conforming data allowing Technoset to set and optimise jobs, and receive dimensional feedback as a job is progressing. It also makes the generation of FAIR reports quick, simple and efficient. The Scan 52’s supporting software automatically saves the measurements as they appear on the screen. Unlike the manual method of recording, both the inaccurate and accurate measurements are recorded, which is useful for route-cause analysis reviews and the optimisation of components as they are developed. The Scan 52 can also assist in the monitoring of tool wear. Periodic tool measurement enables Technoset to optimise the life of its tools, allowing operators to change the tip of the tool before the wear affects the finished component, therefore reducing waste and producing less scrap. Technoset Managing Director Kevan Kane said: “We are extremely proactive with regard to continuous improvement, and always strive to be at the forefront of the latest technology. Investing in this technology is key to keeping up in the industry, and we actively encourage innovation and forward thinking here at Technoset. We are under immense performance and cost pressures in terms of delivery and quality, and it is imperative that we keep ourselves competitive to overseas markets. Taking time to measure parts manually inevitably hits your bottom line, therefore investing in this type of kit becomes a must in order to compete. The Sylvac Scan 52 is the first large step forward in our continued efforts to improve the way we measure though investment on the shop floor. It has subsequently transformed the way we measure components. We are able to automate measurement processes on the Scan 52, and we have the ability to save data electronically, saving considerable time, paperwork, and removing the potential errors that can occur when writing things down and transferring data over. The machine allows us to measure parts in the same location as they are machined for convenience and accuracy, therefore measurements can be taken on the shop floor. Previously operators would be back and forth from the machine, to a projector, to a height gauge, etc; and it was taking forever. But once the Scan 52 is programmed, over 75% of the inspection process can be carried out automatically within a couple of minutes in terms of features and characteristics. Technoset is looking at further development of the Scan 52, and working with Bowers Group to enable the blue tooth connection of other pieces of kit, with the ultimate aim of measuring all the features on a part on the Scan 52. Our operators love the Scan 52; it’s made their jobs easier and has been a significant step up in equipment for them. We make top end, highly sophisticated products with lots of features and dimensions, and they previously complained bitterly about the time it was taking to measure them. Now, they can generate a dimensional report at the push of a button, and then return the part to the machine for adjustments. The Sylvac Scan 52 is fast and accurate, and eliminates the possibility of human error in manual measurement. It allows Technoset to carry out a slick, quick process; delivering accurate results to the customer in a timely fashion.